TUESDAY, Oct. 25, 2016 (HealthDay News) -- For older adults, a fractured hip is often life-changing: The majority will never return to their former levels of independence and physical activity, according to new research. "We all hope for full recovery, but less than half recover to their previous function after a hip fracture," said Dr. Victoria Tang, lead author of the study. The chances of recovery among hip-fracture patients older than 85 with dementia or other health problems are even lower, the study authors found. "By being able to set realistic expectations of the likelihood of recovery, as family members, we can take steps to plan and prepare for future care needs of the patient," added Tang. She is medical director of the geriatric surgery wellness program at the University of California, San Francisco. For older adults, the odds of suffering a hip fracture increase as bones tend to weaken. 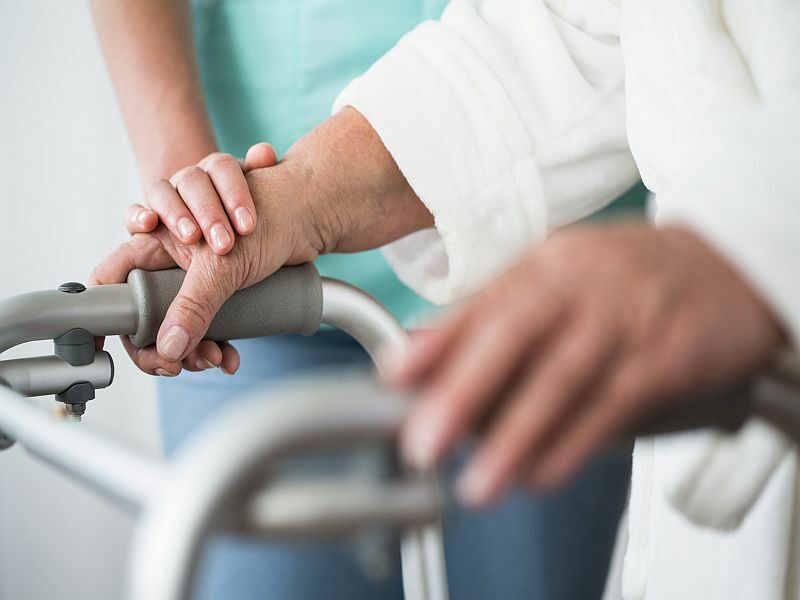 The U.S. Centers for Disease Control and Prevention reports that more than 300,000 people aged 65 and older are hospitalized for hip fractures each year. Using the nationally representative Health and Retirement Study, Tang and her colleagues reviewed data on just over 730 adults aged 65 and older (average age nearly 85 years) who had sustained a hip fracture. The researchers assessed each patient's health and physical ability before and after the injury. For instance, could they walk around the block or climb stairs without resting before their fracture? And afterwards, were they able to dress themselves and get to the bathroom on their own? The researchers found that the likelihood of recovery to the prefracture level of function was less than 50 percent regardless of previous ability level. About one in three returned to their prior daily functioning, according to the analysis. Just over one-third were able to move as before, and only four out of 10 regained their former ability to climb stairs. Even for those who were very physically active before their injury, outcomes were only slightly better, the findings showed. The study authors also found that about one-third of patients returned to living independently without assistance. "From my clinical experience, I see that those that do not recover back to living independently need more support at home with bathing, dressing, ambulating, etcetera," said Tang. "Some move into assisted-living and some move from a skilled nursing facility into a nursing home." The findings suggest a distinctly lower recovery rate than previous studies, the researchers said. However, because this was an observational study, it could not prove cause-and-effect. Dr. Maria Torroella Carney is chief of geriatric and palliative medicine at Northwell Health in New Hyde Park, N.Y. She called the study "important because it has the potential to educate patients and families about the realistic outcomes of a hip fracture in older adults. "It is important to try to understand a patient's long-term care goals, such as whether or not the patient can or is able to undergo surgery," Carney said. Patients will also likely face "an intense rehabilitation process, which may be associated with increased pain and potential complications," she added. Carney said older adults are at greater risk of a hip fracture because of gait disturbances, muscle weakness, and bone mass loss. Bone mass decreases with age, contributing to osteoporosis, a condition characterized by weak and brittle bones. This puts the hip bone at risk for fracture. More than 95 percent of seniors' hip fractures are caused by falls, and three out of four hip fractures happen to women, the CDC reports. To help prevent hip fractures, the CDC recommends that older adults ask their doctor or health-care provider to evaluate their risk for falling and talk with them about preventive measures. These might include taking vitamin D supplements, getting screened and possibly treated for osteoporosis, and reviewing any medicines that might make them sleepy or dizzy. Doctors may also suggest exercises that strengthen the legs and improve balance, as well as taking steps to make the home safer. For starters, it's important to keep floors clear of tripping hazards. Also valuable: installing grab bars by the toilet and in the shower, and put railings on both sides of the stairs. The report was published online recently in the Journal of General Internal Medicine.